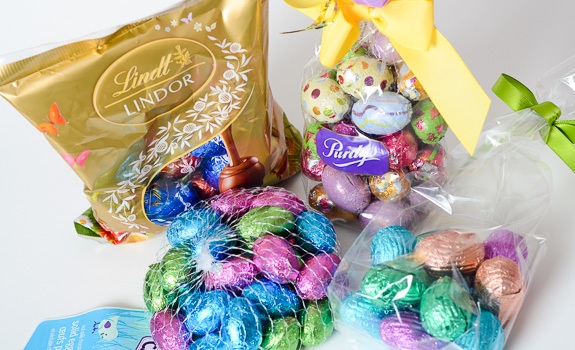 Chocolate Easter Eggs from Lindt, Bernard Callebaut, Purdy’s and Carnaby Sweet. How do they compare? Yes, it’s that time of year again, isn’t it? While the world’s Christians will celebrate the death of rebirth of the son of god, everyone else (and yeah, let’s face it, some of the Christians) will be celebrating the massive quantity of chocolates on offer at shops during the lead-up to Easter. Have you seen the Easter candy selection at London Drugs? When I checked this weekend, it was one side of half an entire store aisle, floor to tippy-toe-top-shelf, plus all the islands of treats in the middle of the store. This is serious business. Note, however, that the chocolate being pitched during Easter is of wildly varying quality. With that in mind, I thought I’d take a look at four of the different chocolate egg options in Calgary, from cheap to fancy. Why chocolate eggs? Because they’re the traditional Easter confection, right up there with chocolate bunnies. Angry Birds Easter treats just don’t cut it. A note about the test: Instead of strange egg flavours, the eggs I’m comparing are milk chocolate (the Lindt eggs are admittedly assorted, but I’ll focus on milk chocolate), and all are available in the Calgary, Alberta area. I tried to pick eggs that were roughly the same size, but this wasn’t always possible. I also tried to select a range of eggs, from national brands to more regional chocolate shops. And so, let the games begin! Review: The new store brand from Shoppers, Carnaby Sweet replaces the Life brand for candy selection. Does it taste like a store brand? Yes. Very basic chocolate, with some light sourness and a rough, gritty texture as it melts on the tongue. Getting some coconut notes in here, but I’m not sure why. Nothing to write home about, but certainly not the worst chocolate I’ve ever tasted. If you gave these to a child, they’d adore them. Loads of sweetness (maybe even overly sweet) without a lot of complexity. Perfect for a high-traffic candy dish at the office. Nothing else comes close to the $0.07-per-egg price. Review: The traditional shape I’ve come to associate with Easter eggs, but made with quality chocolate instead of sour, drugstore house-brand chocolate. These strike the perfect balance between rich, creamy milk chocolate and a reasonable price. The chocolate is smooth and silky as it melts in the mouth, with plenty of flavour intensity. Lots of cream, with some caramel notes to make it interesting. Sure, they cost way more per egg than the Carnaby Sweet brand, but they’re worth it. While they’re not something I’d leave around in a candy dish, I’d cheerfully gift them to someone I cared about. One of these satisfies more than two, three or six of a cheaper egg, and the size is a manageable treat without going overboard. The enjoyment per calorie ratio is bang-on. Review: Callebaut, a.k.a. Cococo, has built a name in Alberta as a premium chocolate shop, which is why I wasn’t entirely stunned by the price of these 11 eggs. Seriously, at $1.18 per egg, there are some mighty high expectations to meet. The surface of each egg has lots of ridges on it, and the egg itself is larger than the Carnaby and Purdy’s eggs. It’s very creamy, with a nice texture and lots of sweetness. That said, I’m getting a bit of cream-cheese taste, which was unexpected and not entirely pleasant. Melts nicely, but I’m not sure about the flavour, especially given the price. Review: The curveball. These chocolate eggs are much larger than even the Callebaut eggs, and they’re filled with fondant, like the standard Lindt chocolate spheres. The exterior of the egg quickly melts and collapses in your mouth. Looking back on it, I should have taken a bite instead of eating one all at once. Crazy, tongue-pricklingly sweet, lots of caramel flavour and rich, fatty fondant. It really is entirely unlike the others. I prefer the Lindt balls because of the size and shape. These are almost too sweet and rich. The verdict: If you asked me to pick one favourite, I’d choose Purdy’s because of the intensity of taste and the quality of the chocolate, combined with the great quality/price ratio. My second choice would, curiously, be the Carnaby Sweet bag of eggs. Why? Because kids – the huge target market of holiday confections – won’t know the difference, the taste isn’t downright awful, and you simply can’t beat that price. The Callebaut eggs are absolutely better than Carnaby, but the cost simply isn’t worth it unless you’re trying to score some romantic points. The disclaimer: The company I work for has partnered with Purdy’s in the past, but it’s worth noting that I genuinely love their chocolates. I’ve loved their chocolates for more than two decades, so any Purdy’s bias is based on this. 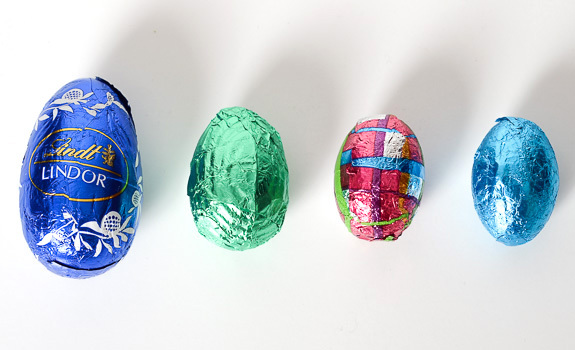 Chocolate Easter Eggs, from left: Lindt, Bernard Callebaut (Cococo), Purdy’s and Carnaby Sweet. They’re not all equally delicious.